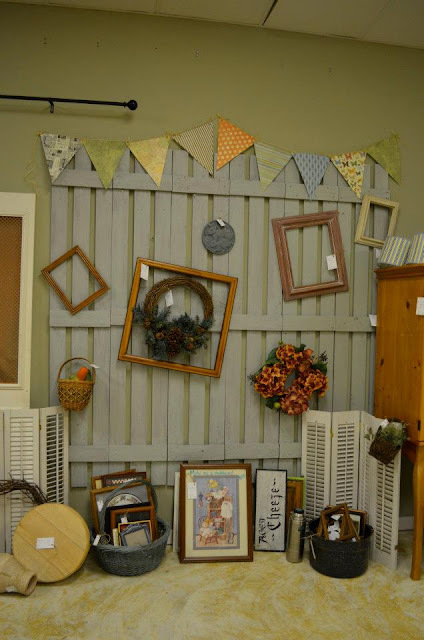 We have quite a few Chalk Paint Classes under our belt and they have been a huge success. We were able to share lots of tips and techniques and learned some ourselves from the pro, Sonny Blaising. Sonny owns Cottage Supply Company (Benjamin Moore store) in Pelham where we hold our class and is working alongside us to enhance the class. 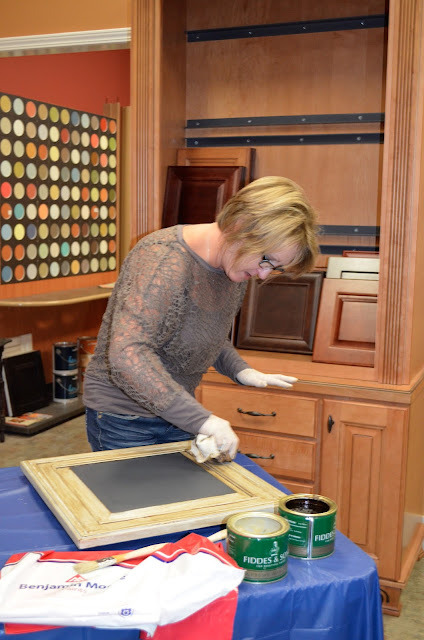 All of the ladies were so excited to learn how easy it is to apply what we taught them, to do their own furniture and even cabinets! You will get to pick out a cabinet door to turn into whatever you desire. 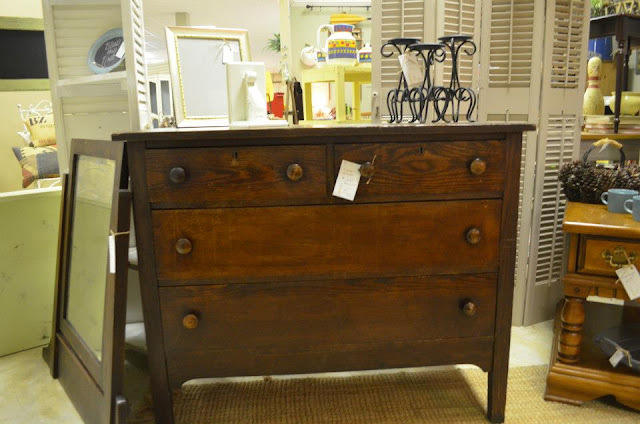 This client painted hers with 2 coats of Benjamin Moore paint with Webster's Chalk Paint Powder. 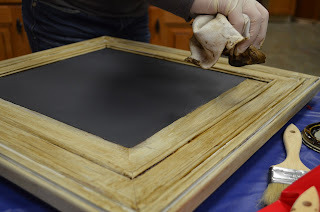 Then she did 2 coats of chalkboard paint and chose to distress by using Fiddes Brown Rugger Wax. It's looking great! Come join us for our next class on Thursday, August 29. We will have a 5:30 p.m. class and if there's enough interest, we'll open one up at noon. The class lasts about 2 1/2 hours. 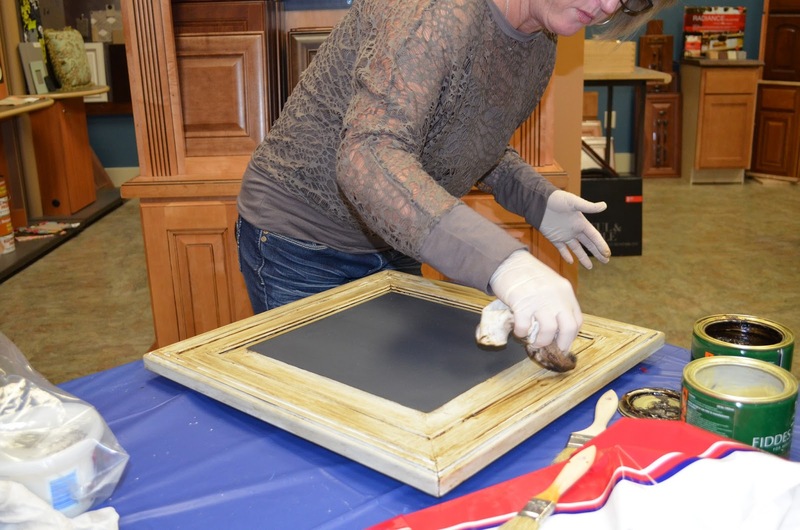 During the class, you will learn the basic concepts of painting with chalk paint, distressing and waxing while upcycling a cabinet door. Plus, we'll share all kinds of tips and hints to make your experience even better! The class is $44 and it includes the cabinet door, Webster's Chalk Paint Powder, brushes, Benjamin Moore paint - your choice of color, supplies and instruction. You'll also be able to use some of our colors and wax. It's looking fabulous! All this in just 2 hours! To sign up, just comment here or email us at notsoemptynest@gmail.com and we'll get you signed up. Classes are limited, so grab a couple friends and join us! 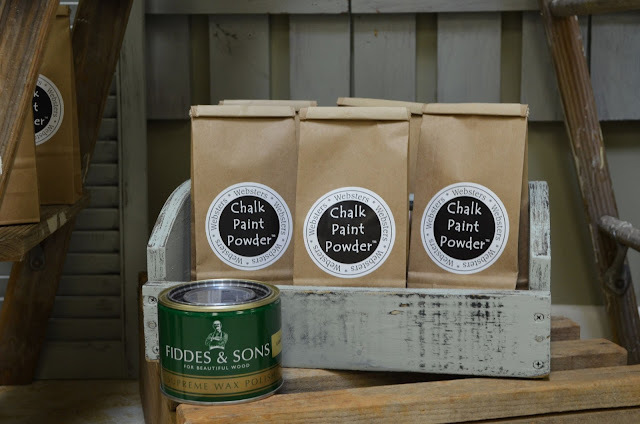 Remember that you can order Webster's Chalk Paint Powder & Fiddes Wax from us (just comment) or purchase it at one of our 4 locations at: Encore Resales & Marketplace in Pelham, AL; Past and Presents in Bluff Park; Peddler's Creek in Columbiana and Greystone Antiques & Marketplace in Greystone. We have a booth in all 4 of these locations. We just flew back home! We have opened a 2nd booth at Encore Resales. 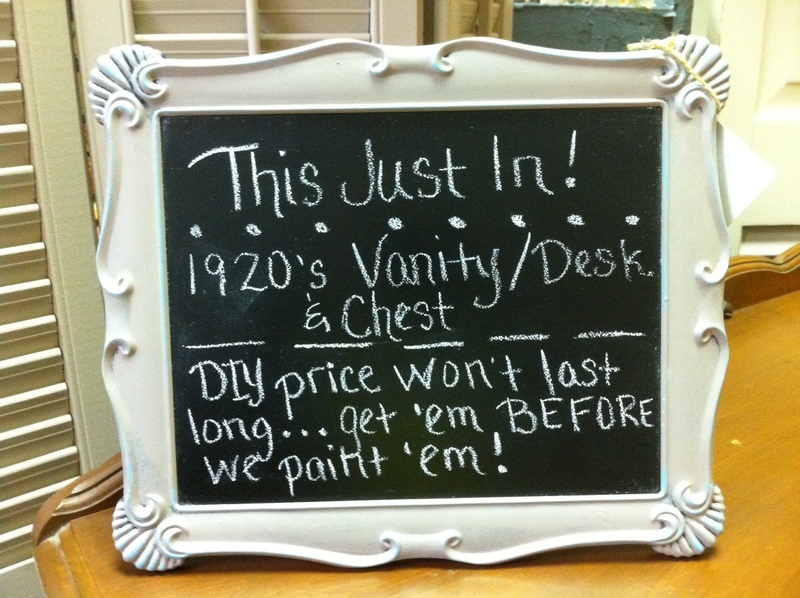 Since we are now selling chalk paint powder, we got a little space back at Encore. We are so happy to be back there. We will have the chalk paint powder and wax plus we will have small items you can purchase to paint yourself! Those are available now, so go check it out! 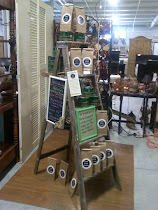 We have a little 3x5 space right now that is just perfect to sell our chalk paint powder and wax. 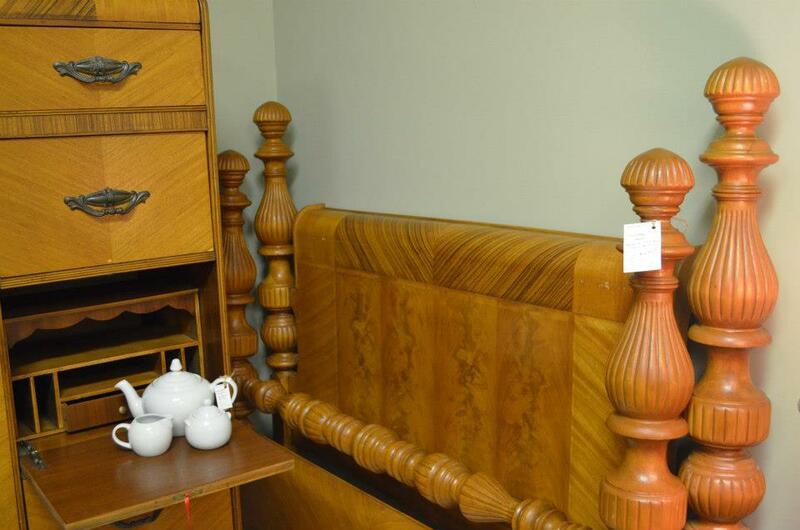 We'll be adding some small items like windows, frames, accent tables - and things like that. We have secured a place nearby to hold classes. We just need to get a couple dates. We'll be holding two classes a month to start out, one in the evening and one in the morning. We are thinking of either Tuesday or Thursday. Let us know if you have a preference by leaving a comment and we'll nail it down soon. We have a great space at Benjamin Moore in Pelham. It's just about a mile from Encore. 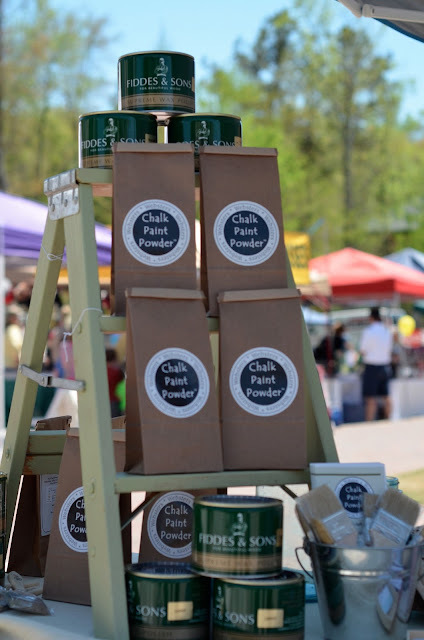 You can also buy paint powder at our booth at Greystone Antiques & Marketplace. We have lots of small things to paint there, so now that the weather is fabulous, get those paint brushes out and get to painting! For directions to both of our booth sites, just click the picture on the right sidebar! 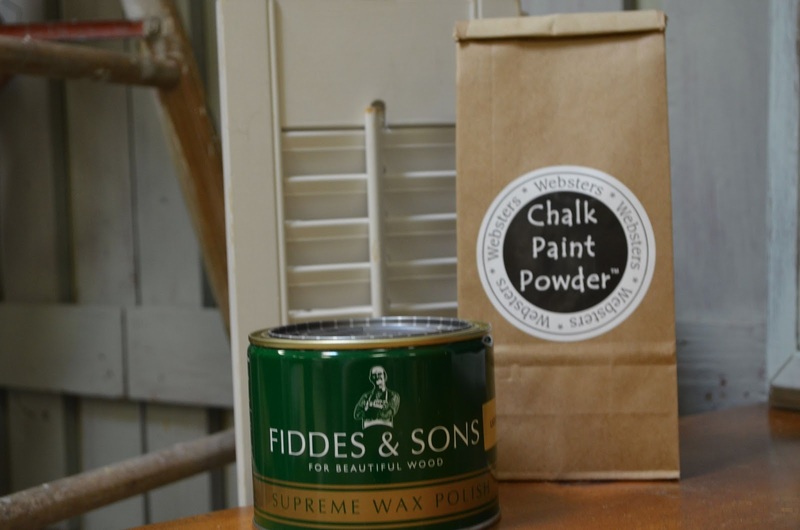 Webster's Chalk Paint Powder is here! It's here! 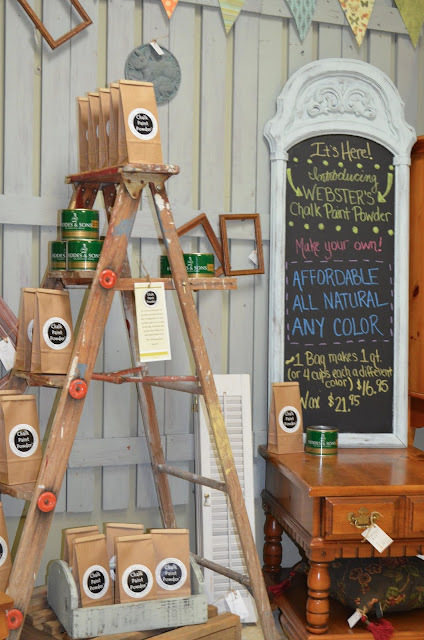 We are now carrying Webster's Chalk Paint Powder at "The Not So Empty Nest"! 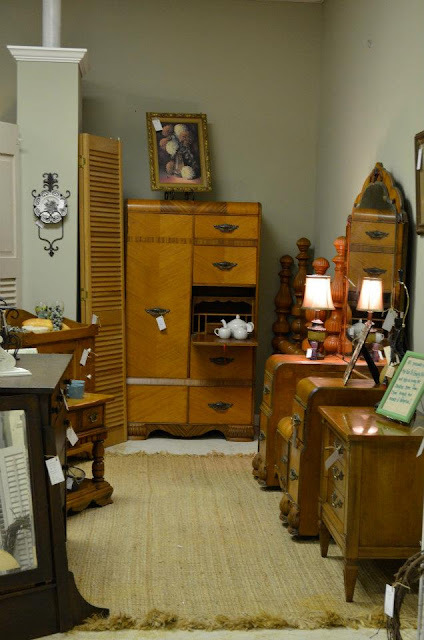 Visit our booth at Greystone Antiques & Marketplace on Highway 280. Just click on Ayla's face on the lemonade stand on the sidebar for directions. 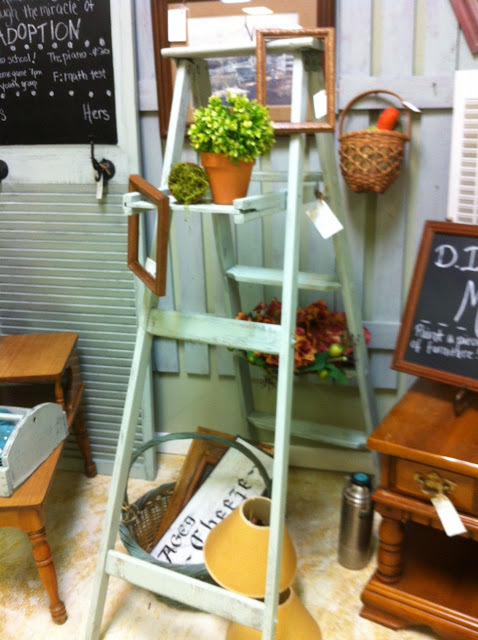 All you need is 1 bag of Chalk Paint Powder and water to add to ANY COLOR latex paint. 1 bag of Chalk Paint Powder makes a quart of paint OR 1 cup of 4 different colors! The sample sizes you get at any paint/hardware store are perfect! Many DIY mixes are toxic. Ours is all natural and not harmful! The wax has a very pleasing vanilla smell and is the best we've used. We'll be holding classes soon around Birmingham. 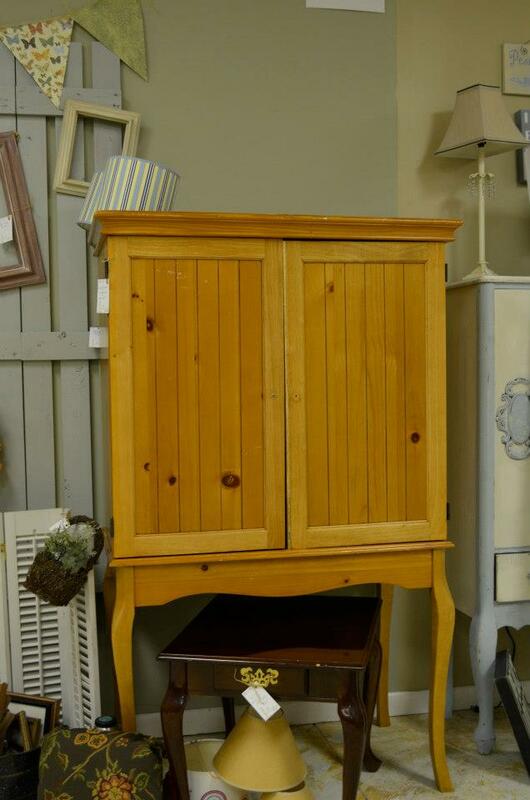 For $25 we'll include a sample size of powder, cabinet door to upcycle, paint brush, container & lots of great ideas! Let us know if you'd like to sign up. We're looking for some good spots around town, so gather your friends and we'll come to you! If you're not from the Birmingham area and would like to order, just email us at The Not So Empty Nest and let us know what you'd like. Coming Soon! 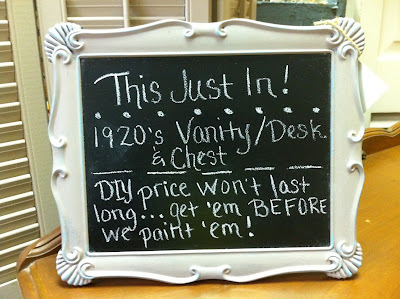 Chalk Paint Powder! We are so excited about a new product we will be stocking! It's Chalk Paint Powder. Our first shipment should be coming tomorrow so we'll get to painting and stocking it later this week! You can mix this powder with ANY latex paint - flat, satin and even eggshell finishes. 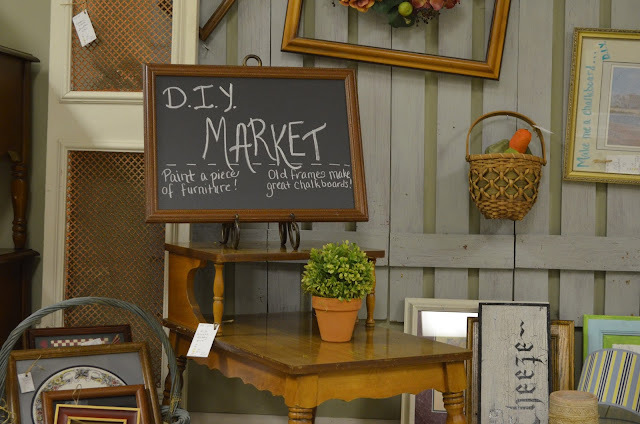 You can paint furniture, chalkboards and much more - all without priming and sanding! The colors are unlimited and it is very cost effective. We are the first dealers in Alabama and are very excited as this is another avenue God is blessing us with to help bring home another little girl from China. We just wanted you to be the first to know and we'll have more details coming soon! 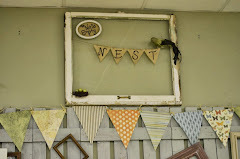 We just put some awesome vintage pieces in "The Nest", and we are just itching to get our hands on them. Lucky for you, the garage is full and our hubbies won't let us take it over this time. 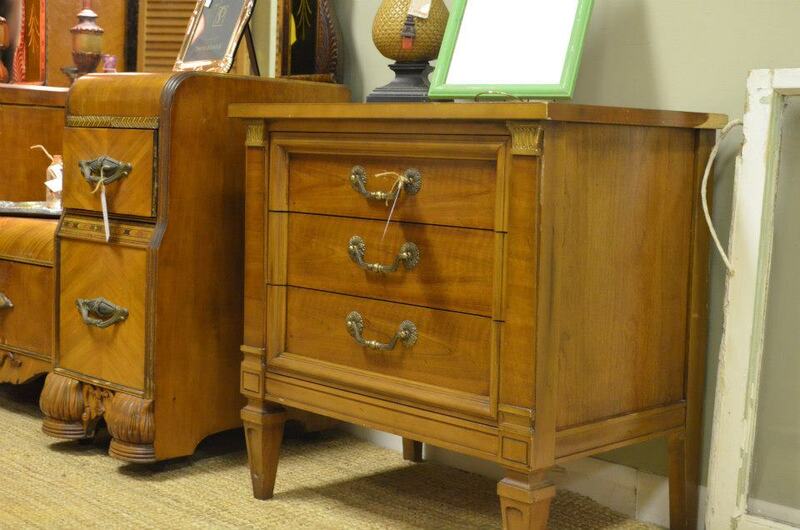 So what we're doing is putting our pieces in our booth, and passing them on to you for your own TLC. That way you can decide if you want to leave them in their natural beauty or choose what color to paint! 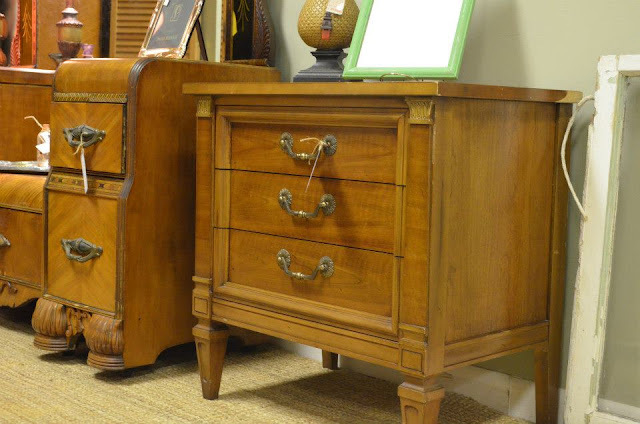 These latest 2 finds could be absolutely gorgeous either way. The detail is fabulous! We love the hardware! 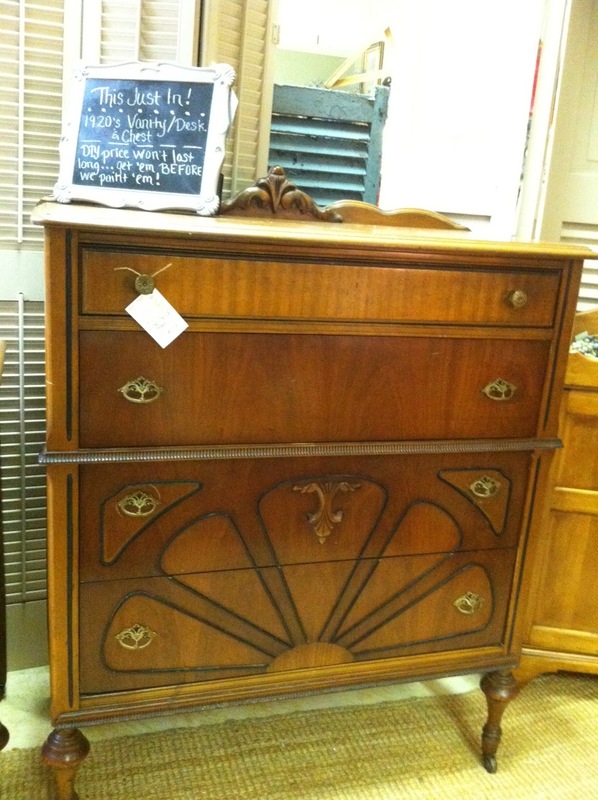 Here's a gorgeous chest of drawers from the 1920s. It has dove-tailed drawers; original, gorgeous knobs and even the backside is a work of craftsmanship. All the drawers work great! This is priced at $289. 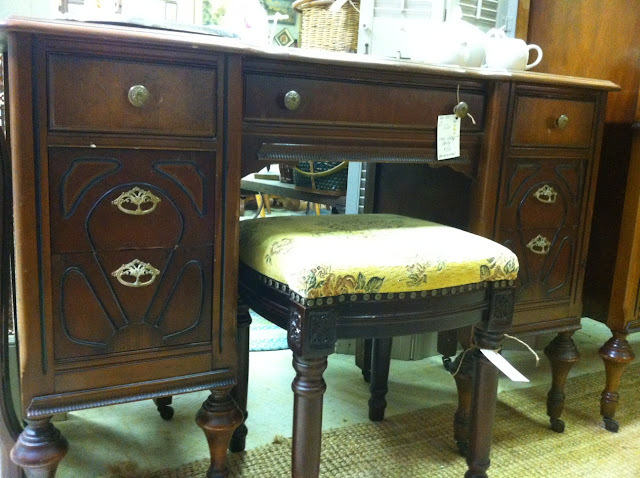 Here's a matching vanity that has a mirror and stool. We are selling all of these separate since it would also make an awesome desk. The vanity is priced at $259. This stool is priced at $39. You can choose to keep the vintage fabric or recover. 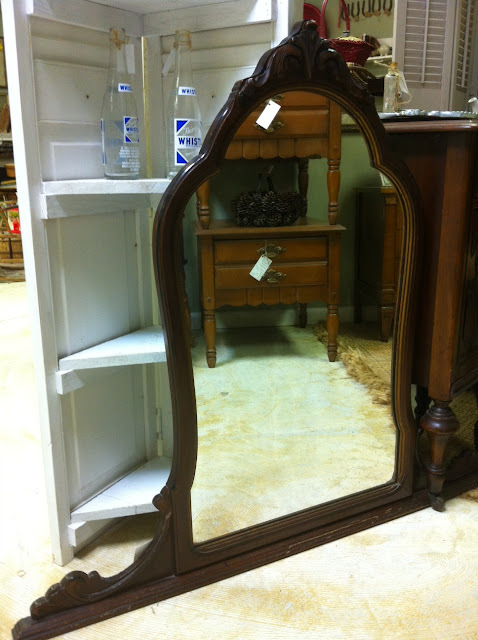 This mirror could be used on the vanity, as a hanging mirror or would make a gorgeous chalkboard. It's priced at $59. Look at the detail in these pieces. We did get a little painting done in this freezing weather and added this old ladder priced at $69. If you look to the left of it, you'll see a door turned message board with a chalkboard and hooks! that is just dying to be painted! We took a metal frame that hadn't sold (for $5) and brought it home and made a chalkboard out of it. Now it's $19. It's really a putty color with a patina rub and turned out awesome. So we gathered up a few more frames that haven't sold and will put our touch on them soon. This chalkboard above sums it up pretty good! You'll have a few weeks or so to buy low before we get our hands on it and make it even more special! Of course, with a 2.5 year old trying to "help" bring her sister home, the painting takes a little longer . . . 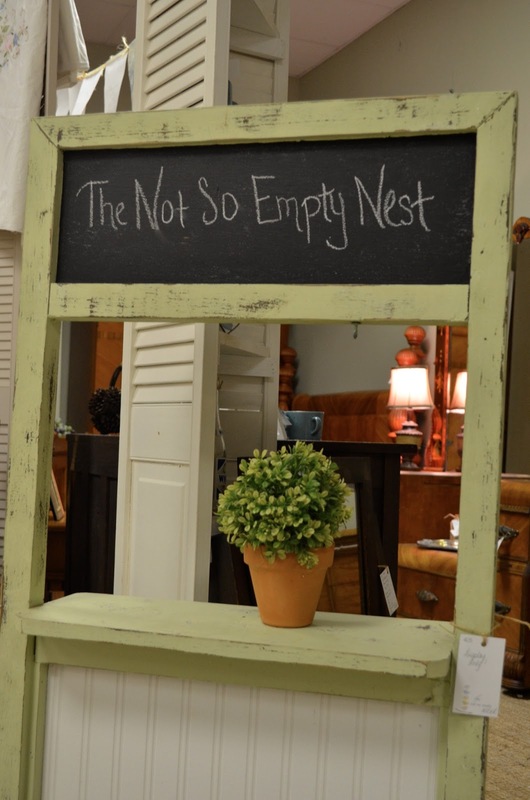 When you visit Greystone Antiques and Marketplace just ask for "The Not So Empty Nest". We're in the very back left corner of the store. It's Not Bye Bye Birdie . . .
We flew the coop for awhile, but we're back in business Peeps! Since a cute, little 2 year old is running around, we don't have as much time to paint and repurpose furniture. We were actually going to shut down our shop, but since Ayla wanted a baby sister, it's back to work for us! 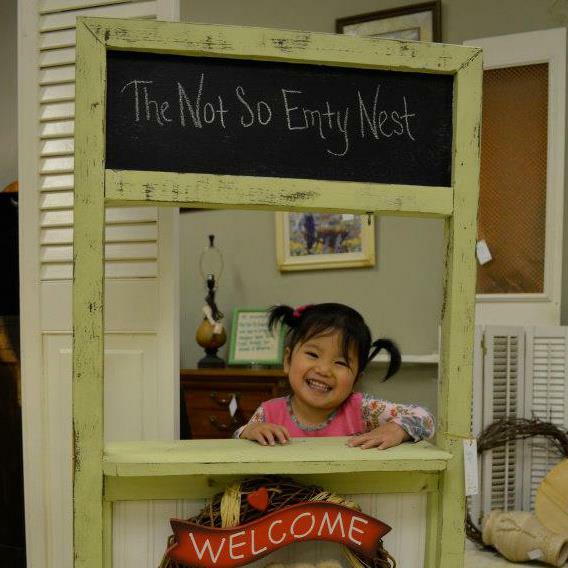 You might see this cutie at "The Nest". So instead of concentrating on repurposing furniture, we are going to find some great pieces for YOU to redo. We have already found some great vintage pieces that are perfect as they are. 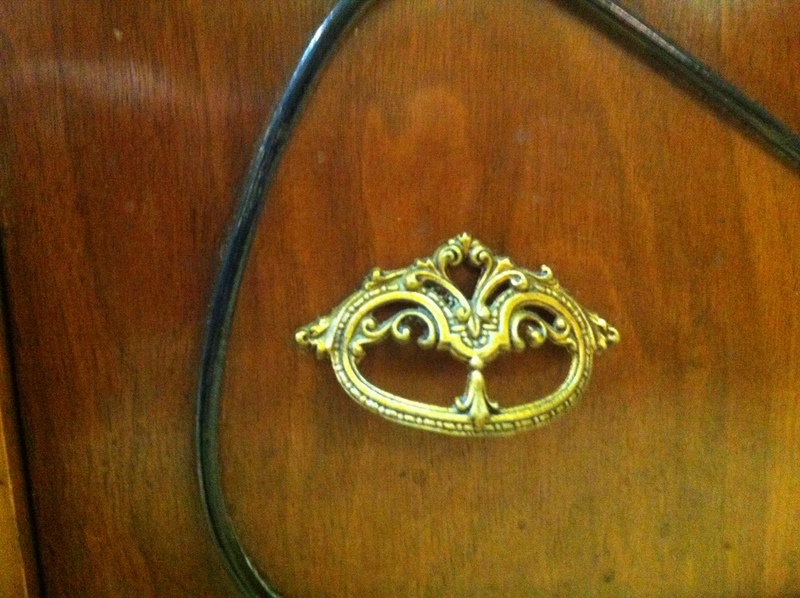 We will do the picking on some great deals, so you can personalize your own pieces. We'll even give you ideas to enhance your project. 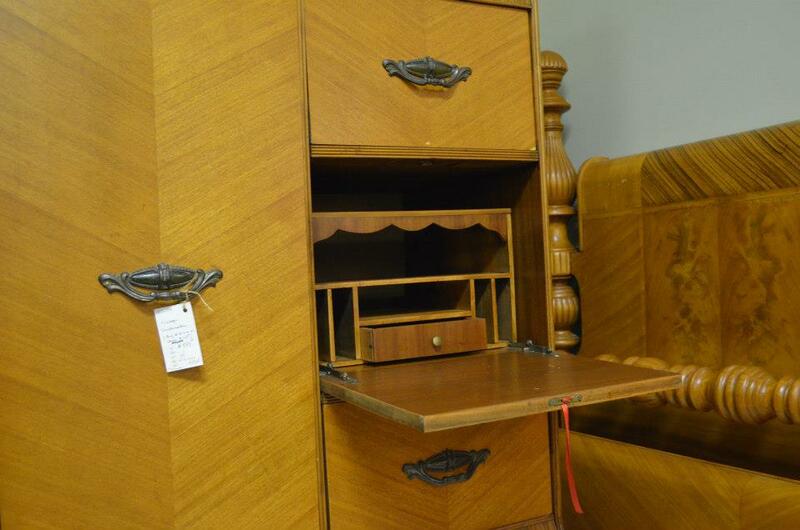 This vintage waterfall chifferobe is a gorgeous piece. It has a great cedar closet. 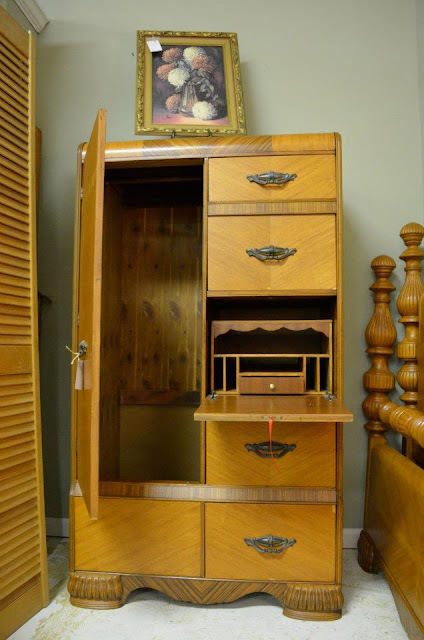 This secretary comes out too, but I love how this could be used as a desk! 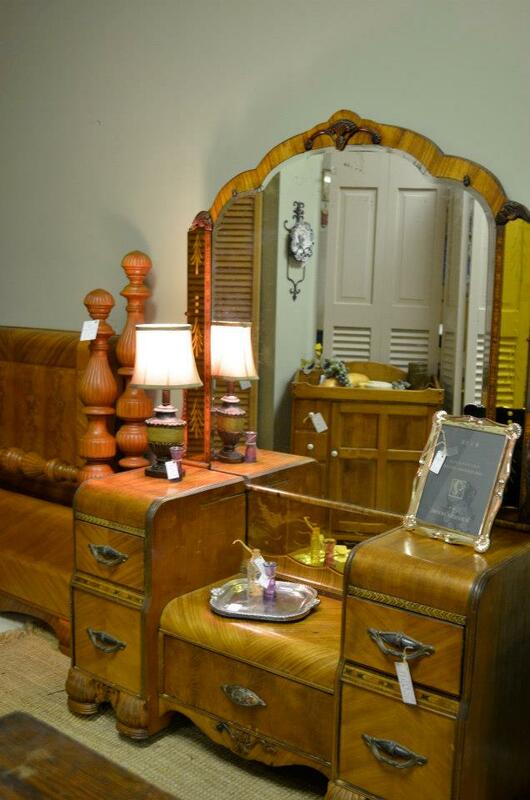 This beautiful headboard and footboard match the chifferobe and dressing table below. This set just keeps getting better and better! Buy all 3 and save $100. Here's another vintage dresser. There's a matching mirror on the side. We are going to put it in high gear again. We'll still do a little painting, so don't be surprised if you see a piece of furniture you're looking at this disappears for a few days and comes back looking even better and with a higher sticker price! So you better beat us to it! 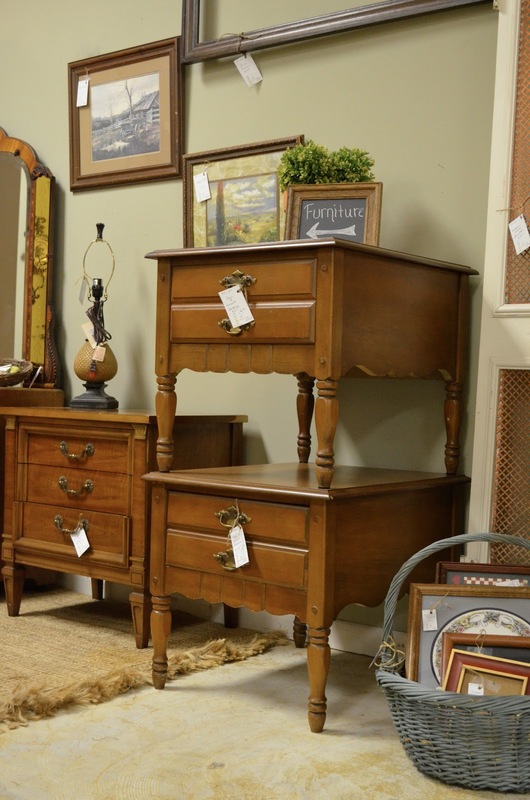 If you're looking for a particular piece, let us know and we'll stay on the lookout for it. We have some great tables and chairs right now too. Our booth has moved to Greystone Antiques & Marketplace on Highway 280 in Inverness. Come through the front door, take a left and go to the back of the store. We'll be on the right. 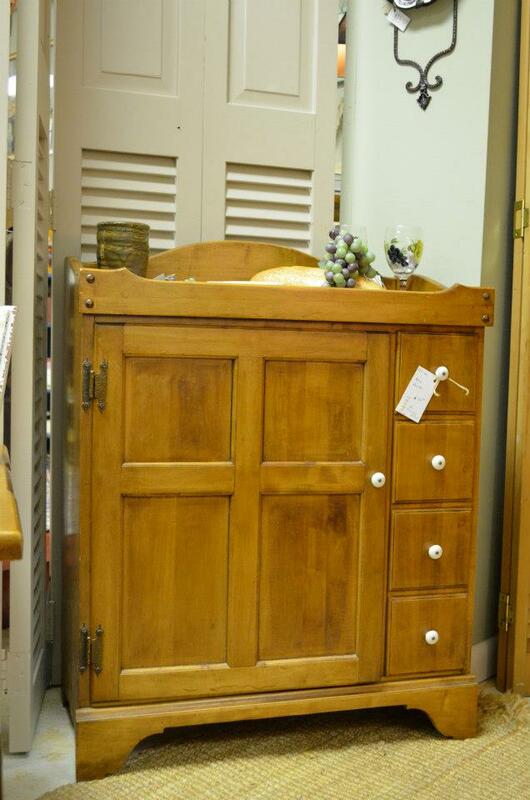 This is actually a TV stand, but we think it could go great as a linen closet. A little paint and a couple new "old" knobs . . . 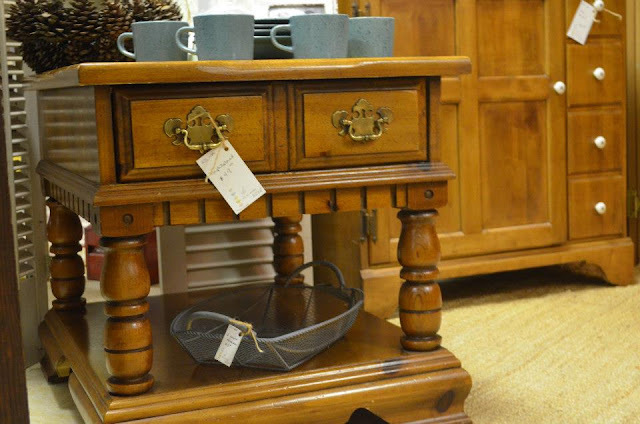 Very nice, heavy end table. We could see this painted and distressed to make it pop even more! Here's our DIY Market. We have frames, shutters and more priced to sell for your DIY projects! 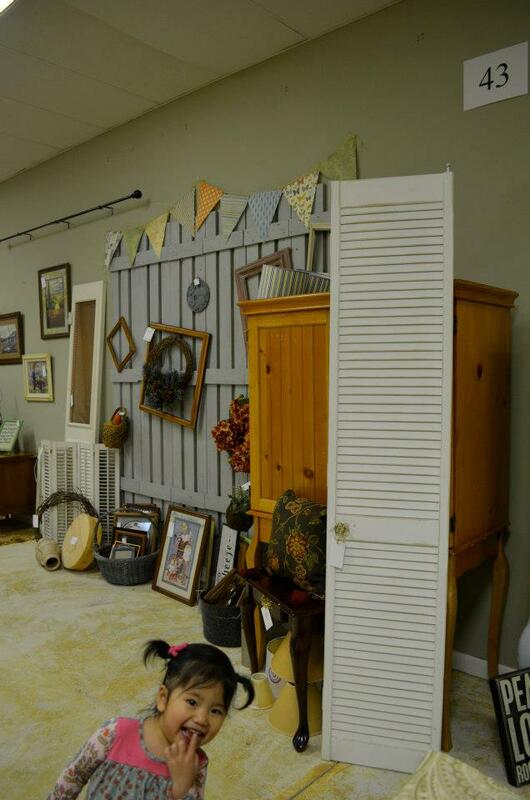 Some great pieces for sell, but not this cutie that photo bombed us! How cute could this be somewhere? To paint or not to paint . . . It's beginning to look like "The Not So Empty Nest" again! We'll be on the lookout for even more mirrors and frames so you can turn them into chalkboards or use for your gallery walls. Fly on over and visit "The Nest"! I became a gramma in November (DeBe) and that's all I've wanted to do since then. Tiffany was nesting in preparation to get Ayla from China and getting her house all ready. They have been home for about 2.5 months now and are doing beautifully. She fits right in with us and we love her tons. If you want to see pictures and read all about her, you can go to adoptedeternally.blogspot.com. Our booth at Encore was pretty bare, so I finally lit a fire under us and we have added some new items. We haven't hit a single yard sale this year, but we have enough in our garages to get us by for awhile. We just gotta figure out how to paint with a 2 year old underfoot. We're a bit rusty, so give us a while to get back into the groove aka we didn't take a single picture of the booth the other day. We're just having too much fun with our little girls for anything else to matter. This shop is full of unique items at great prices! Lots of cool stuff to paint here! This was our original "nest"! Find treasures here to repurpose! Unique vendors and new "vintage" items from market! Back to School and it's Chalkboards Galore!